Company Overview - Wuxi Taihu Grain Machinery Co., Ltd.
2YRSWuxi Taihu Grain Machinery Co., Ltd.
Wuxi Taihu Grain machinery co, which is established in 1998 and a large company mainly in design of production lines,manufacturing and installation as well as degugging of equipment for animal feed ,wooden and straw pellet ,and organic fertilizer pellet .With our super design ,highly performing equipment ,perfect service and first-class techniques,we have won the support and trust of customers.at present ,we have successfully undertaken the design,manufacturing and install aton for hundreds feed product line. 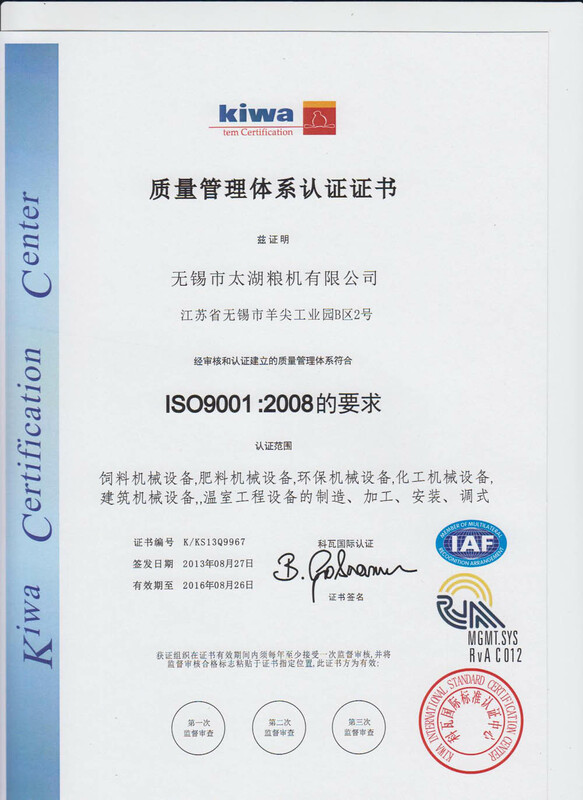 In the past ten years, we have conquered the market and won rapid development with our business spirit of professionalism attention,perseverance,innovaton and our business vision of gaining growth together with partners all over.with our powful R&D,production capability and perfect after service system,we have passed the certification of ISO9001:2000 international quality management system and is awarded "high -tech Enterprise of Jiansu province",so as to provide quality products and a serial service for customers. the feed equipments for design . manufacture installation and commission.